Our Progress — the databases we have finished downloading. Budget and Spending — our finances, which are publicly transparent. The safety of US government climate data is at risk. 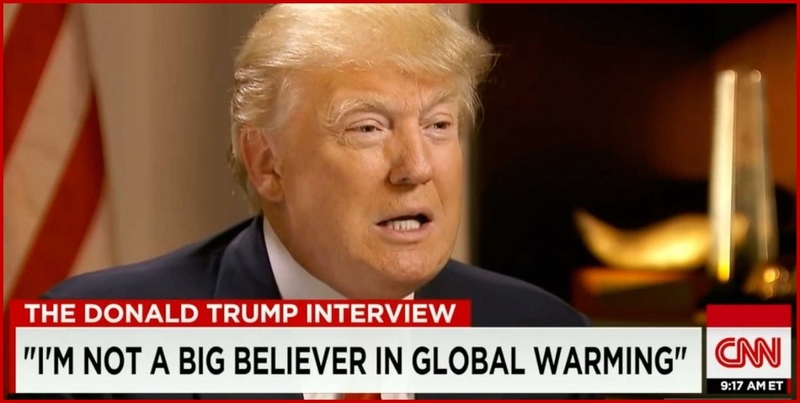 Trump plans to have climate change deniers running every agency concerned with climate change. Trump's choice to head the Environmental Protection Agency, Scott Pruit, calls himself a "leading advocate against the EPA's activist agenda". Pruitt even sued this agency to block Obama's plan to fight global warming. Trump's choice for the Department of Energy, Rick Perry, has claimed that "we have been experiencing a cooling trend", and said "there are a substantial number of scientists who have manipulated data so that they will have dollars rolling into their projects". This makes it imperative to back up the many climate databases held by US government agencies before the Trump administration takes them offline. We hope he won't be rash enough to delete these precious records. But: better safe than sorry! Brady Dennis, Scientists are frantically copying U.S. climate data, fearing it might vanish under Trump, Washington Post, 13 December 2016. The Azimuth Climate Data Backup Project is part of this effort. We are planning to back up 40 terabytes of data from NASA, NOAA, and other agencies. Our team is led by four volunteers. Jan Galkowski is a statistician with a strong interest in climate science. He works at Akamai Technologies, a company responsible for serving at least 15% of all web traffic. He began downloading climate data on the 11th of December. Shortly thereafter John Baez, a mathematician and well-known science blogger at U. C. Riverside, joined in to coordinate publicity for the project. He'd already founded an organization called the Azimuth Project, which helps scientists and engineers cooperate on environmental issues. So, we called this new effort the Azimuth Climate Data Backup Project. When Jan started running out of storage space, Scott Maxwell jumped in. He used to work for NASA — driving a Mars rover among other things — and now he works for Google. He set up a 10-terabyte account on Google Drive and started backing up data himself. A couple of days later Sakari Maaranen joined the team. He's a systems architect at Ubisecure, a Finnish firm, with access to a high-bandwidth connection. He set up a server with Hetzner that provides us with 10 terabytes of storage, gigabit bandwidth and 30 terabytes of a monthly traffic. We can expand the storage space as needed. We want to keep US government environmental databases safely backed up until larger institutions step in and help out. We are computing hash codes for these datasets to help us prove our backups are authentic. To contact us, send an email to John Baez at baez@math.ucr.edu. Azimuth Backup Project (part 1), 16 December 2016 — first steps, and the formation of our team. Azimuth Backup Project (part 2), 20 December 2016 — the databases we are backing up. Azimuth Backup Project (part 3), 22 January 2017 — our progress as of this date. Azimuth Backup Project (part 4), 18 February 2017 — our Kickstarter campaign succeeds! Saving climate data (part 1), 13 December 2016 — the problem, and the frantic rush to save data. Saving climate data (part 2), 16 December 2016 — the worldwide effort: the Climate Mirror Project. Saving climate data (part 3), 23 December 2016 — how to prove a backup is authentic. Saving climate data (part 4), 21 January 2017 — the first days of the Trump administration. Saving climate data (part 5), 6 February 2017 — moves by the Trump administration, and the pushback by scientists. Saving climate data (part 6), 23 February 2017 — the new threats to Environmental Protection Agency databases.